I've been reading Dean Wesley Smith's miniseries of blogs where he publishes a running log of his progress as he writes a 70,000 word book in 10 days. When I first blogged about what Dean was doing I wasn't sure whether I was reading between the lines correctly but he has confirmed, over and over again, that he has no idea where he is going with the story, not even a rough sketch. ... do you have an end in mind when you start writing? As in, you know you’ll be in San Francisco at the end of your trip, but you don’t know if you’ll take a plane or a camel? Suzan, No. Not a clue, no idea, don’t care where it ends up. I’m just writing to entertain myself, just as a reader is entertained by reading a book. Do you, as a reader, need the ending before you start reading? Of course not. Why is everyone so surprised I don’t need it either. Did your jaw hit the floor? Mine did! I was thinking about Dean's mini-marathon this morning and it hit me. Dean is doing a Harlan Ellison. ... many of you know that over the decades he [Harlan Ellison] has tried to prove this point* (and many others) to people. He would go into a bookstore, have someone give him a title or idea, then on a manual typewriter, he would sit in the bookstore window and write a short story, taping the finished pages on the window for everyone to read. He never rewrote any of those stories. He fixed a typo or two, but that’s it. And many of those stories won major awards in both science fiction and mystery. All first draft, written fast, in a window while people watched every word. I know, I was going to publish a three-volume set of these award-winning stories written in public back when I was doing Pulphouse Publishing, but alas, he was still writing them, a new one almost every other week at that point, and the book never got out before we shut down. He’s done enough since then to fill two more books at least. * That one should only rewrite to editorial demand and, even then, only if you agreed with the demand. That quotation was taken from a post Dean made in 2009. There he writes, "I would have a tough time doing what Harlan does" but I think that's essentially what Dean is doing, ghostwriting a book in 10 days while positing a running log of his efforts. Instead of onlookers peering through the windows of a bookstore he has us, the denizens of the internet, and instead of a bookstore, he has his blog. Dean Wesley Smith often refers to Robert A. Heinlein's rules of writing. And with good reason, countless writers have attributed their professional success to them. That said, I'm not suggesting there are hard-and-fast rules to writing, rules everyone must follow. As with everything, take what works for you, leave the rest. 3. You must refrain from rewriting, except to editorial order. 4. You must put your story on the market. 5. You must keep your story on the market until it has sold. - What if the story never sells? Leave it up forever? Wouldn't that be a bit like displaying a black-eye that never healed? - Should independent authors market their work? If yes, should we wait until we have a certain amount of work on the market--say, 10 books or anthologies--or should we start with the very first one? I'm sure there are countless other questions. I don't have answers, although I do favor the idea of holding off on expensive or time-consuming marketing efforts until a writer has been able to put a significant amount of their work up for sale. Of course, each of us is unique and so no set of rules, even rules as wonderful and wise as Heinlein's, fits us all. 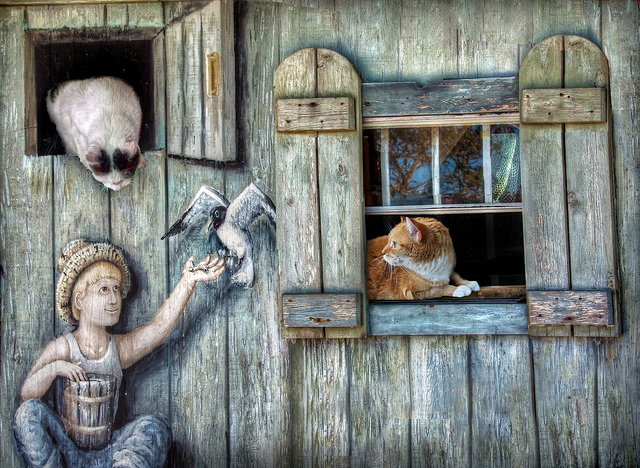 Photo credit: "The Bird Watchers" by psyberartist under Creative Commons Attribution 2.0. These folks say a lot of good things. And I agree with them. I like how these principles pawn the myths about uber-planning one's novel. For instance, regarding fantasy - I saw a lot of articles on blogs talking about how an author should plan and plot, dreaming up the world and every intricate thing it, religion, races, geography, history, lore etc. I couldn't believe my eyes. That was a formula for non-fiction (scientific literature), not for fiction. You dream up little bits of the story and you end up writing them. Somehow, along the road, those bits will fit together. If they seem that they don't, look further into it and you'll find a solution that works, without ruining the bits/changing their essence. And as for rewriting. Do it only if you want to, if you found a better way to express the particular idea, emotion, event, description etc. But don't do it, if it's not for artistic reasons. If it's for commercial/marketing reasons, or for the sake of "political-correctness". Don't do it. Consider carefully the pros and the cons. More often than not, challenging conventional wisdom yields better outcomes. And for me it's true. Writing for myself is what I love. Writing for what someone else likes, I don't think I'd be able to do that. "Writing for myself is what I love. Writing for what someone else likes, I don't think I'd be able to do that." Excellent point. Reading Dean's posts lately it has struck me that he's having fun. And a big part of the reason for that is, I think, that he's writing for himself, he's writing the kind of stories he loves.